The purpose of this project is to gain some insight into city-wide biking trends by analyzing the Divvy trip data. Also, I examine trip data from one bike station at the University of Chicago to compare the biking patterns at the university against city-wide trends. All the results and plots presented in the pages below should be reproduceable on your computer. Follow the Setup Instructions if you are interested in reproducing the results for yourself. These are the results of my analyses. They were generated by rendering the R Markdown documents into webpages. A first glance at the Divvy data. A map of the Divvy stations in Chicago. Exploring daily bike commuting trends from the Divvy data. 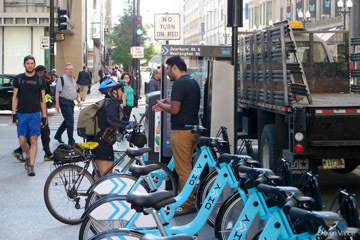 Exploring seasonal biking trends from the Divvy data. This workflowr project was developed by Peter Carbonetto at the University of Chicago. Thanks to John Blischak and Matthew Stephens for their assistance and support. Also, thanks to Larry Layne and Austin Wehrwein for sharing their analyses of the Divvy trip data that inspired some of the investigations here. This R Markdown site was created with workflowr 0.7.0.